The transverse flute seems to have been unknown in Europe until it arrived from the Byzantine (Eastern Roman) Empire in the Middle Ages. Because it first became known in German lands, it acquired the name "German flute" to distinguish it from other types of flute (such as recorders) that are held vertically. It appears in pictures and poetry beginning in the 12th century, and seems to have been used in courtly music in 13th-century Germany along with harp, fiddle, and rote. A century later it appears as an outdoor military instrument with bells, drums, bagpipes and trumpets. We know nothing definite about the construction, repertoire, or playing technique of the instrument in these early times. Most pictures show an instrument proportioned like the north Indian bansuri, a bamboo flute with a relatively wide bore in relation to its length, but certainly no standard form existed. 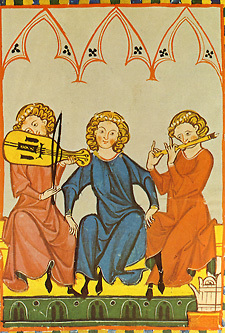 It is not certain how or whether instruments and voices performed together, as in the picture at left. The period had no concept of harmony, but its music is based on the concept of modes. Chapter 1, 'Shepherds, monks, and soldiers', of Ardal Powell's The Flute (Yale University Press, 2002) contains more information on this topic.